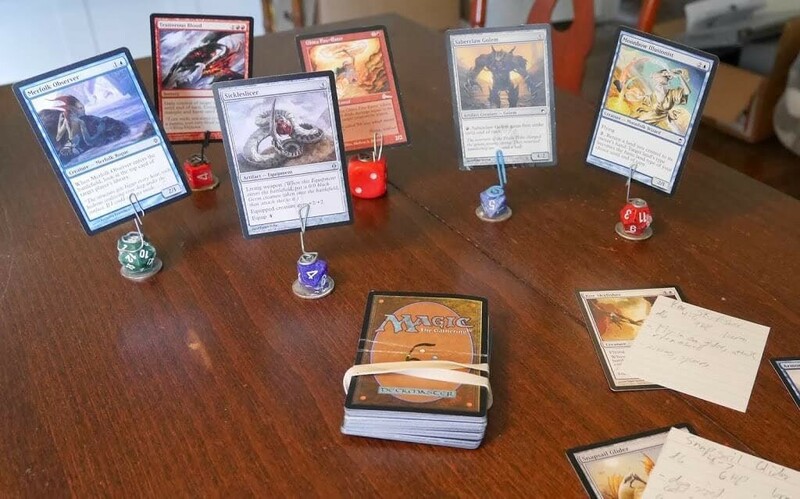 Have you every heard of Magic the Gathering? Due to my obsession with Videogames and computers, I don’t have much money left over for cards. MTG never really grabbed me, but it laid waste to the wallets of my friends. On an unrelated note, I am terrible at coming up with interesting monsters on the fly. I usually default to skeletons, lions, bears, or eagles. There’s just a mental block that keeps me from coming up with or describing monsters well. I’m best with people, pretty good with environments and story, but portraying monsters is my biggest weakness. What I really need is a piece of easily accessed artwork that I can base my descriptions and monsters off of. Maybe like, printing out cool pictures I find online, cutting them out, and gluing them to notecards? Or taking several years of drawing classes, and become an expert in lore and biology to create new and unique monsters? …Or I could just draw a random Magic card and base a monster from it. I started this about a month ago, and it has completely changed the way that I GM. Whenever my players begin combat, I quickly shuffle through some Magic cards, looking for something that would fit with this location or encounter. When I find one, I take another minute to jot down some Stats, estimating and guessing instead of being exact. I write down weaknesses, how the monster will fight, etc. Then using the image as reference, I’ll describe what the monster looks like, and how it attacks the party. Monsters are consistently unique and interesting, while the prep time required for me has been knocked down to a minimum. Magic cards are easily acquired from my friends, and their have closets FULL of cards that will never be used. It’s been fun for me too! Since monsters are created on the fly, I can really mix up an encounter, and result in unexpected or emergent gameplay experiences. Here’s a quick document I wrote about adapting Magic cards as monster for your game. With DW, its super easy, but it might take a bit more time for other systems. Once you convert about 20-30 cards, you have enough monsters to grab and use whenever you need, for 3-4 games worth of adventures. The next problem I faced was how to use the cards in-game. I didn’t have enough of each card for all the monsters. If the parts is attacked by 3 goblins, but I only have one card, how do I handle that? 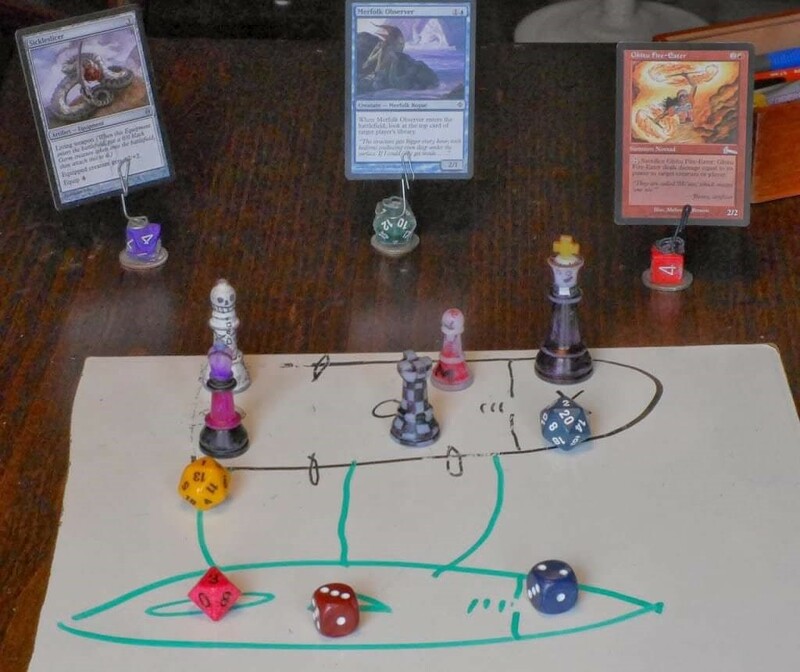 Solution: Dice holders. In this scenario, the PCs(Player Characters) are sailing their ship down a river (the black ship). Every player picks a decorated chess piece to represent their characters position in the battle. Monsters are represented by dice. This particular battle has got 3 types of monsters engaging the players. In my notebook, I can easily keep track of each monsters HP and stats, while the players can see where they are in relation to everyone else, who’s closest, who’s in the way, etc etc. So far, it’s been working VERY well, and the excellent art and variety in Magic cards gives a lot of atmosphere to my games. Let me know if you have other cool ideas for Magic cards, or resources for monsters.